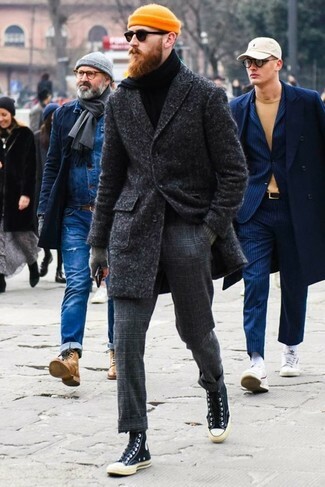 For a nothing less than incredibly stylish ensemble, try teaming a charcoal overcoat with charcoal check wool dress pants. 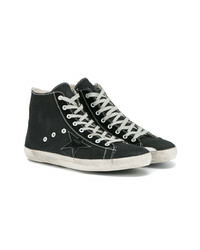 To break out of the mold a little, grab a pair of Golden Goose Deluxe Brand black canvas hi top sneakers. This combo of a teal puffer jacket and light blue jeans looks awesome, but it's super easy to put together. To bring out the fun side of you, complete your getup with a pair of black canvas high top sneakers. If you're hunting for a casual yet seriously stylish look, dress in a blue denim jacket and tobacco skinny jeans. Both items are totally comfortable and will look great together. Make black canvas high top sneakers your footwear choice to make the outfit current. 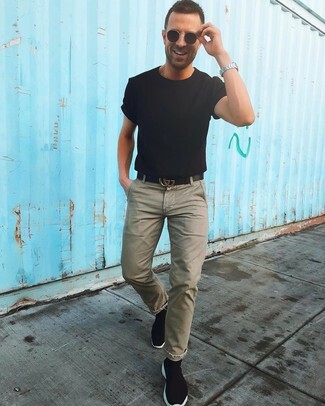 A black crew-neck t-shirt and olive chinos are among those game-changing menswear elements that can modernize your wardrobe. 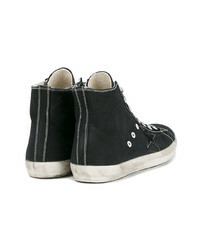 Kick up the cool of your ensemble by rounding off with Golden Goose Deluxe Brand Black Canvas Hi Top Sneakers. 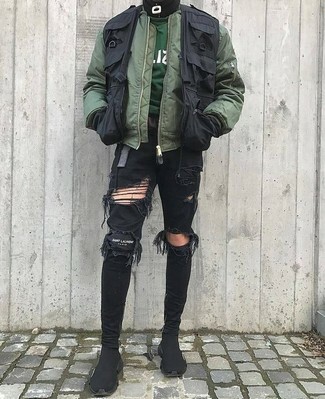 If you're a fan of functionality dressing when it comes to fashion, you'll love this easy combo of an olive bomber jacket and black ripped skinny jeans. Consider black canvas high top sneakers as the glue that will bring your ensemble together. If you're all about being comfortable when it comes to dressing up, this combination of a yellow tank and charcoal sweatpants is right what you need. 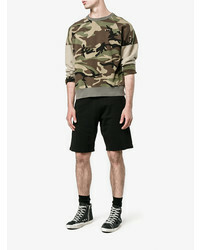 Balance this outfit with Golden Goose Deluxe Brand black canvas hi top sneakers. For a nothing less than incredibly stylish look, wear a black and white houndstooth overcoat and black dress pants. To bring out the fun side of you, finish off your look with Golden Goose Deluxe Brand black canvas hi top sneakers from farfetch.com. If you're after a casual yet seriously stylish outfit, try teaming a white and red and navy plaid long sleeve shirt with olive chinos. Both items are totally comfortable and will look great paired together. 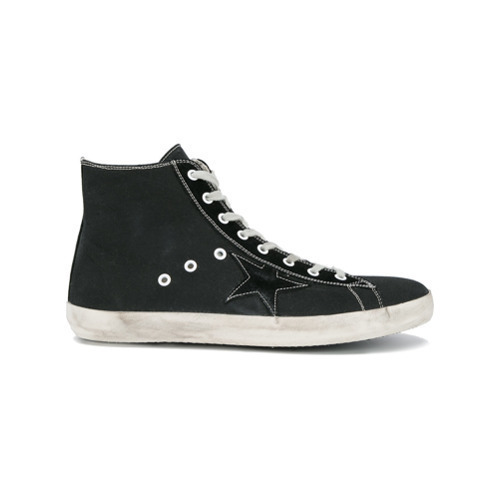 Golden Goose Deluxe Brand black canvas hi top sneakers will give your look an on-trend feel. 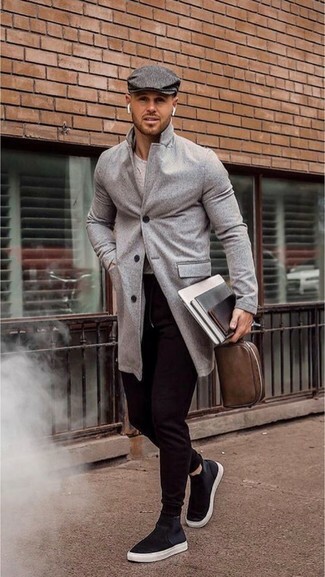 If you're after a casual yet on-trend look, go for a grey overcoat and black sweatpants. Both pieces are totally comfortable and will look great paired together. For something more on the daring side to complement this look, rock a pair of Golden Goose Deluxe Brand black canvas hi top sneakers.